Unfortunately, it isn’t enough just to bring a dog into a forest, let it sense the scent of a truffle and then order it to search for another one. Training a dog to search for truffles is an art where the owner has to work quite hard with the relation between man and animal. According to my guide, Filippo, the truffle dogs are often crossbreeds and not of pure race. Even though I don’t know the syllabus at the Truffle Dog University, which was founded in 1880 by the great-grandfather of Giovanni Monchiero, the present owner, it certainly isn’t easy to study there! Since the dogs have to pass a demanding education, they receive a certificate of completion at graduation. We witnessed a simulated search for truffles in a hazel nut plantation in the vicinity of Roddi, meaning that before the search started, Giovanni had hidden some truffles at various places in the hazel nut plantation. Being a good truffle dog, it even found other truffles not hidden by Giovanni. During the simulated search Giovanni let his dog walk around freely, but following the instructions of his owner. 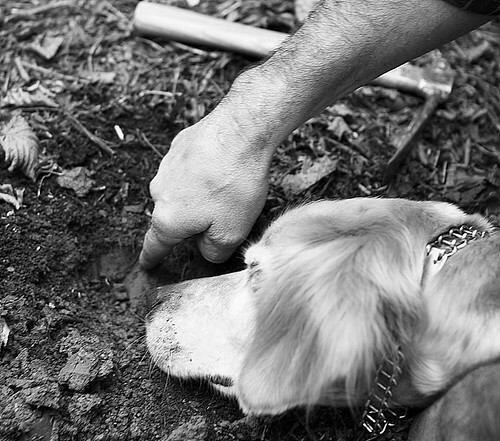 When the dog found something interesting, it started immediately digging with his forepaws, indicating to his owner where to find another choice truffle. Then, Giovanni stopped the dog digging, and started digging carefully himself using both his hands and a tool called a sapin, ideal for digging gently. At the same time, the dog was lying on the ground, observing what was happening and waiting for his reward. After having found another truffle, the dog is always given something good to eat and lots of caresses. While we were watching the truffle hunt, it seemed like Giovanni and his dog acted almost like one. A citation from the web site of Giovanni should suffice to confirm this: only a close relation with the right dog will allow the owner to recognise the signals indicating the presence of a truffle.